Nothing worse than burning your toast first thing in the morning. One, it’s just annoying. Two, that smell can linger all day long. 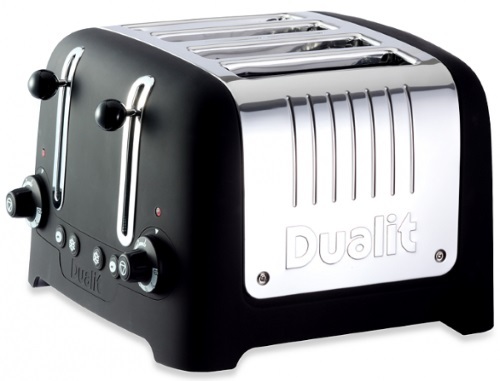 Introducing a smarter toaster by Dualit. This toaster has patented Climate Sensing Toasting Cycle technology. What that means is it monitors the temperature of the toaster and what is being toasted so it can compensate for the correct toasting time. It also has a “peek and pop” function which allows you to look at the toast without having to reset the timer. Yes, please. This is really amazing way to save space in those cluttered kitchen drawers. Yes, you can get some kind of random jar to hold your utensils, but that’s what all of the regular old normal people do. These are not utensils that someone just glued a extremely familiar shaped brick onto the end of a spatula. Those bricks are actually a part of the utensil. 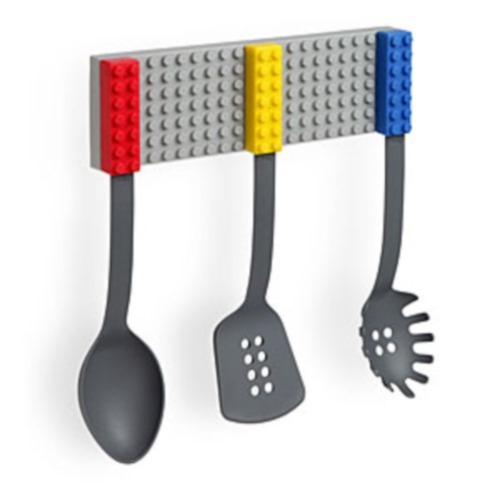 The set comes with the grey base plate, a spatula, ladle and pasta strainer. You can purchase this set for 34.99 here, which we feel is a little bit spendy. But if you are the chef in the house, this may come in super handy and should be well worth the expense. 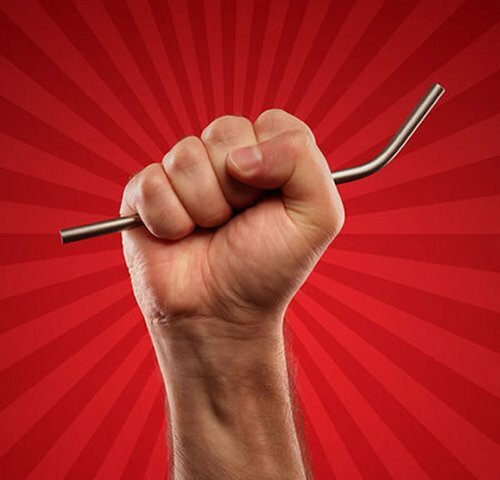 This straw is the strongest straw ever made. No bending, no ripping, no tearing. It’s made of titanium so it can even be used for hot drinks without getting hot itself. Juice box giving you problems? This baby sticks right in. Stab an orange for an instant juice drink. Stab it through an aluminum can and you have yourself a metal juicebox. This space age marvel is just $15. Drink anything anywhere at anytime. 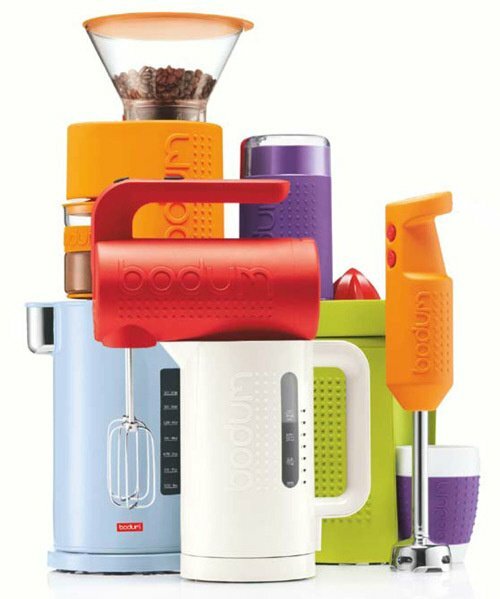 Bodum is actually calling their upcoming Bistro line of appliances “rugged,” wrapped in rubber and dotted with grippy outsides, they look like they can stand up to an abusive housewife. Unlike me, who gets beat regularly and cowers in the corner. The line comes in a wide array of colors and they reportedly feel “Spongy but durable”. I’m not sure there’s a market for such rugged appliances that look more like power tools, but women are sure to dig those colors. We go through lots of fruit in our house and most of it is apples. We tend to throw the apples in the fridge in a bowl. My daughter is too small to open the fridge and get an apple herself, which means I have to get them for her and any parent of a young child knows they want to be independent. The fruit also tends to be bruised easily in a bowl and my kids won’t eat bruised apples. A new fruit holder that should work for any roundish fruit like apples and oranges has been unveiled by Swedish designers Michael Andersson and Maria Axelqvist. 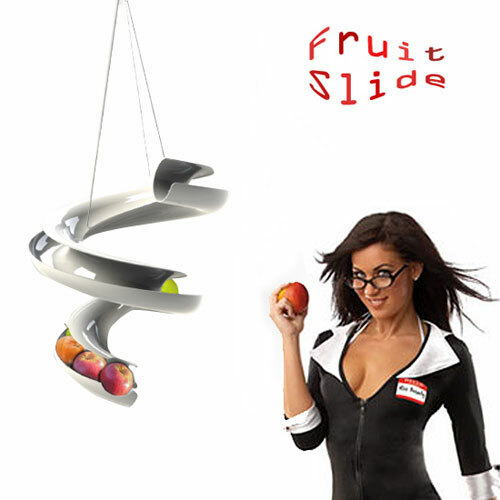 The thing is a tube that curls around and looks like a little version of a water slide with an open top and should prevent bruises pretty well. In the psychedelic world of late sixties Beatles, you can easily see one of them using this thing to make tea that will later be stirred by a Blue Meanie. Perfect for when you are in an Octopus’ garden having tea in the shade. Tea infusers are usually metal though, aren’t they? Is this even safe? 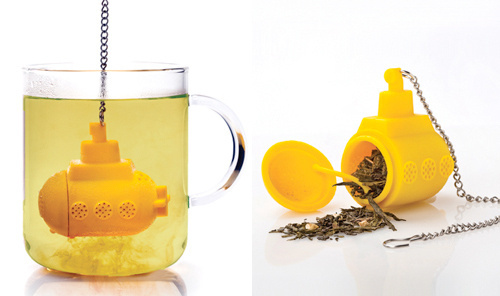 If I drink of this tea will I suddenly be transported to Pepperland? See Lucy in the sky with diamonds? Is the Walrus really Paul? When you were a kid, your mother would tell you to slow down when you were eating too fast. Thankfully, as an adult you no longer have to put up with that. Let me introduce you to your mother, the plate. A plate that will nag you and tell you to slow down. 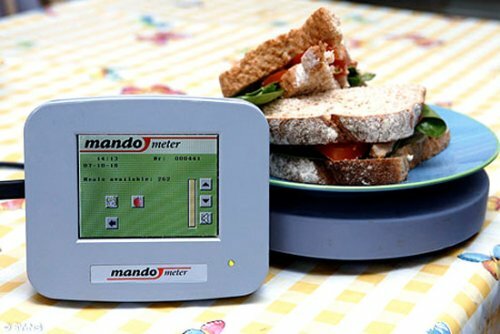 It’s called a Mandometer and it weighs the food on your plate, and times you, even verbally reprimanding you when you eat too quickly. A study claims that the Mandometer reduced the Body Mass Index (BMI) of test subjects by 2.1% over 18 months. Your grandmother wants this for Christmas. Be a good grandson or granddaughter and get it for her won’t you? This gadget is so much more than just a giant mech-suit for your jars. It can help those with arthritis(and the weak) open jars with ease. The rest of us can just use cloths or run our jars under hot water. And if your jar doesn’t fit in this huge contraption, you probably should ease up on your food portions. Come on, grandma deserves this. Whether she can figure out how to use it is another matter entirely. Well, the name says it all. Who hasn’t been screwed by Wall Street? 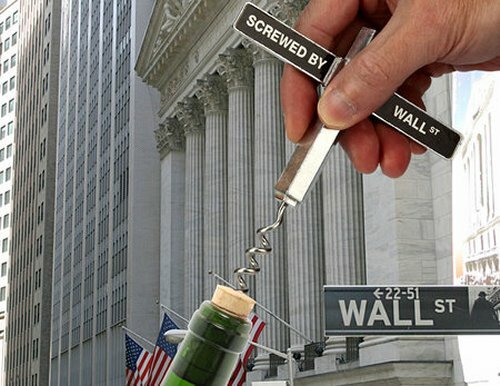 Now you can relive that screwing and know that you are SOL with this cool Wall Street themed corkscrew. It will cost you just $25. Which you probably don’t have thanks to these Wall Street fat-cats. Feel free to curse and call them names as you uncork the bottle, pretending that you are sticking it in some banker’s ear…Or other orifice. So you want a nice cold beer, but all you have is warm. Well, there’s no need to pop them in the fridge and wait forever for them to get cold. The solution? 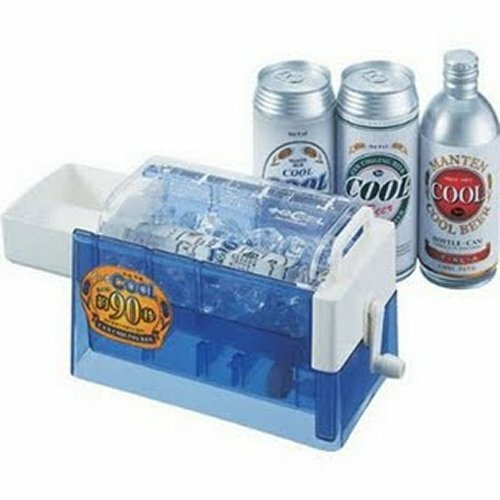 A simple box with some ice in it that rotates your beer,getting it ice cold quick. Just 90 seconds apparently. Sure, it’s work, but isn’t a cold beer worth it? It will cost you $15. And don’t think that you can just stick your beer in a bucket of ice and get the same result. Obviously the magic here is in the rotating. This is beer science. Don’t question it. 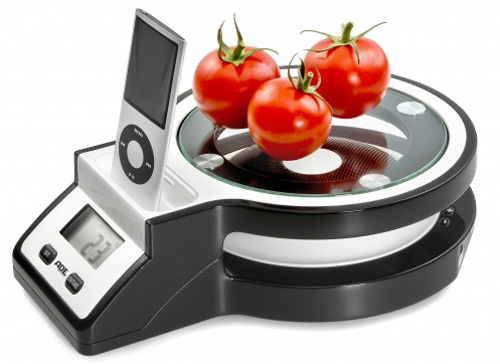 At last, you can measure kitchen ingredients and dock your iPod at the same time. Because you can’t go anywhere without your iPod right? And you no longer have to thanks to manufacturer Rihanna, who is working on this $100 kitchen scale due out next year. It sports an iPod dock and a 2W speaker under the glass platform. Your iPod displays the song while a black and white LCD displays the weight info. Thanksgiving is all about stuffing yourself with great food after waiting way too many hours for that Turkey to cook in the oven. And turkey isn’t all that great if we’re honest. However, frying things is always the answer. But as you’ve no doubt seen in many youtube videos, frying up a Turkey can be dangerous. 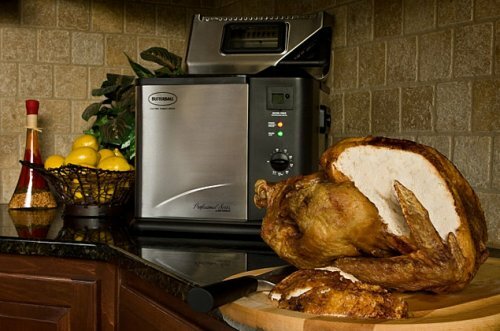 The Butterball Turkey Fryer makes it a whole lot safer for just $120. 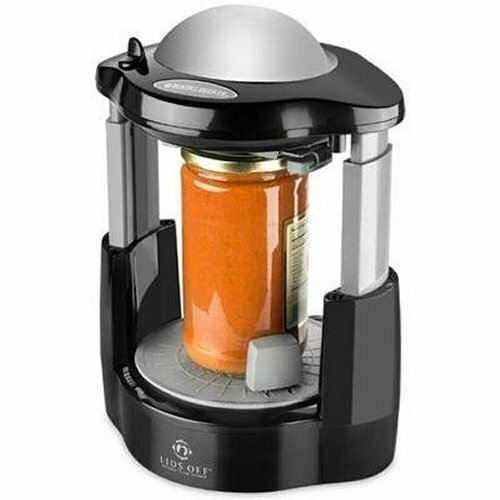 This fryer can handle birds up to 14 pounds and features a digital timer, adjustable thermostat control, a fold-away lid with viewing window and built-in filter. The included cooking basket also works for foods other that Turkeys too. 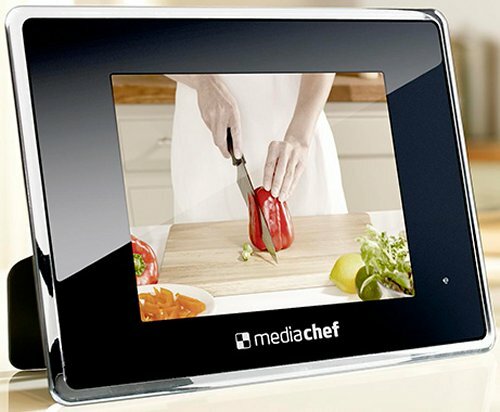 Cooking tablets and recipe readers are usually very blah, but this one looks like it might actually be great for cooks. The Qooq is a 10.2-inch kitchen helper that features the usual recipes, along with meal prep videos, instructions and even advice on choosing the right ingredients, shopping lists, meal planners and more. All of that info can be updated monthly with a subscription. It sports a touchscreen, Ethernet and USB ports, SD slot, WiFi, and a built-in stand. There’s no browser, but it does have built-in weather, digital photo viewing, and internet radio apps, which is cool. Remember how mom always had those hand written recipes on 3×5 cards? Well those days are gone. Now mom watches all of those fancy cooking shows on the food network. 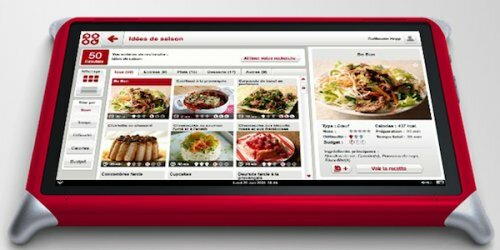 So it makes sense that Belling’s new Media Chef digital cookbook actually contains 48 cooking instructional videos from chef Brian Turner on its 8-inch screen. You get an included remote control and the device can also function as a general media player, calendar and photo frame. It will retail for about £170 ($271 US). We don’t know when it will be available though. Man, hot dogs are such a pain to make. First you have to open the package, spill nasty hot dog juice all over the place, put them in the pan and boil them. Who has time for all of that work and clean up? Not you and not I. That’s why you go to 7-11 and get them off of their rotisserie. Well, now you can do it the way 7-11 does it with this Hot Dog Rotisserie. 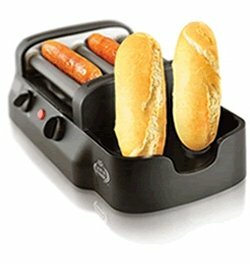 It cooks 4 hot dogs on the non-stick rollers and can warm two buns at once. The fat from the hot dogs or sausages drips down into an easy to clean tray so you stay nice and healthy. Well, as healthy as you can be eating hot dogs.